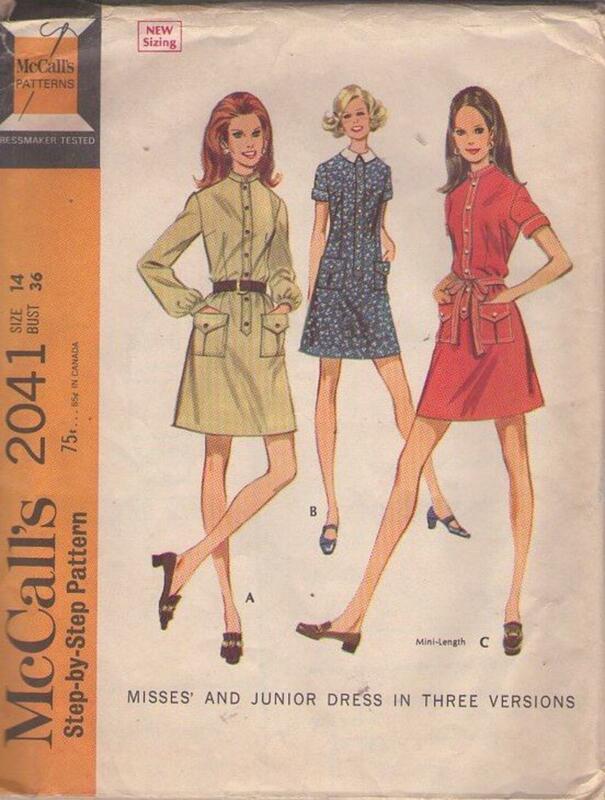 1969, 60s Mod, Retro Daytime Clothing Patterns - Dress, with long or short set-in sleeves, is cut in regular or mini length. Dress, darted in front and back, has center back zipper and faced neck. Band and pleated and flapped pockets, sewn on front, are button trimmed. Long sleeves are gathered into snapped bands; short sleeves are turned back to form cuffs. Long sleeved and mini dress have faced, two-piece band collar included in neck seam. Mini dress has self fabric tie belt. Other short sleeved dress has faced, two-piece collar, of contrast fabric included in neck seam. Dresses are stitch trimmed and interfaced where necessary.